Any suggestions on improving the subject plastic kit? I don't expect to make it into an AA resin beauty, just make it look better. Too many great decals to go to waste without a cheaper alternative on which to apply them. I've seen people build beautiful models of the Revell kit. It's a lot of work but that's the fun part, isn't it? I'm sure lots of people can give you more details on how to fix the Revell 747! I also read that the wing root is wrong and that the canoes that house the mechanics for the flaps start too far forward under the wing. I beloven this only applies to the two canoes closest to the fuselage under each wing, so 4 in total. Regarding the engines I believe they are OK for GE CF6-80's with the exception that the exhaust cones go from wide to narrow in a straight line, where it should be a more wavy line or coke-bottle shape if you will. Greatest issue for me was the nose section. So i cut it from a Revell 747-200 and now it looks very well. The new kit I am working on is the Iron Maiden release that is going to be British Airways. This Revell mold is just about ready for retirement. Lots of flash and distorted parts, the APU exhaust was only half there and warping is a problem. The engines are from Bra-Z. Some mentioned here a while ago that Revell had reworked the mold to correct the problems but I don't see it on this kit. The CF6 is the cone shaped one, it's the PW4056 that has the coke bottle core. To add to these, the winglets are a bit off as well, you'll see it when you look at it. I guess you have to ask yourself the question "how many bugs can I live with?" Next, figure out how much rework you're willing to do, and plan accordingly. If you're looking to save cost relative to an AA 744, you might be better off getting a Revell 748 and a set of resin engines. Then you just fill the extra rudder hinge line, scribe an extra flap segment, scratch the winglets, and chop out two tube segments. Probably less work than fixing the 744 kit. And.... the wing roots are in the wrong place, and the airfoil profile is far too skinny. The kit is a mess from nose to tail. 8 frames forward (behind the upper deck door). 3 frames aft (between the L3 and L4 doors - good luck on that! Steve wrote, "there was a thread here somewhere that demonstrated how to correct the wing attachment". Does anyone know where this is? Share, please, as at my age I need something to keep me awake! Ok, I stand by my earlier recommendation. Better to saw two donuts out than to do all that wing root fixing. Lots of opinions on the fuselage of a cut-down -8, but what about the rest of the airframe? Especially the "new" -8 wing and the (aftermarket?) engines and their pylons? Are the Revell -400 parts usable for the latter? Thanks. I couldn�t find that illustration! Gerry, for some reason this post has me thinking about getting my hands on a Revell -400 to see if there's not a way it can be brought up to snuff with a little less fuss. 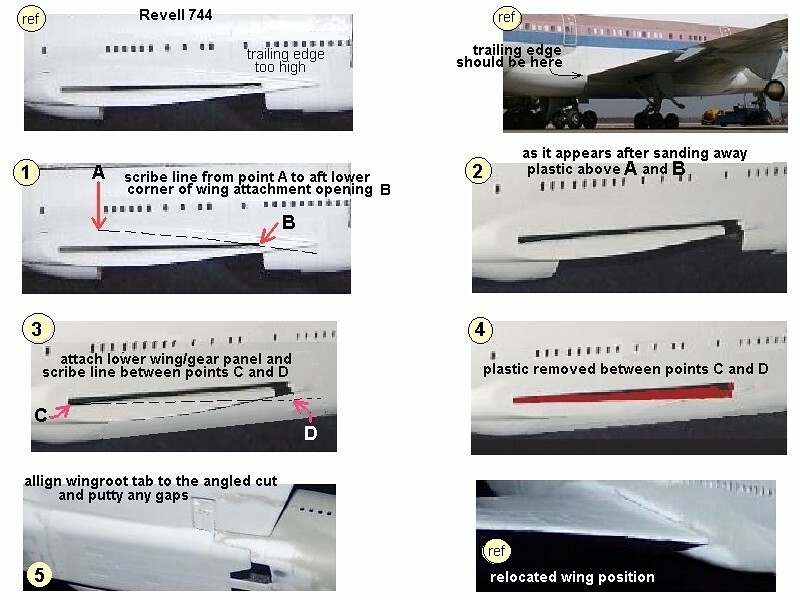 I'm already thinking about an alternate method for fixing the wing angle, for instance, and if I can find a Revell -400 cheap at next weekend's airliner show at the Delta Museum I may buy one and do some experimenting. I know a cut-down Zvezda kit could be turned into a really nice -400, and while there are several parts from the Revell kit that would be useful in a kitbash project with the Zvezda kit, it makes me ache a little to think of substantial parts of two kits ending up in a dumpster. Buying two kits to use only about half of each could get pricey, too, which might run afoul of the desire to stay cost-effective. If things work out and I end up with a -400 kit I can use as a testbed, I'll share my results. I know it's not a great kit, but having once been the fat kid on the playground that people made fun of, my heart kind of goes out to it a little. You can always sell the unused parts... always have somebody looking to buy extra parts!! Aside from the wing tip and the different flap configuration, the -8 wing is the same shape as the earlier wing. The airfoil is different, but nobody is going to notice that on a model. Yeah, the flap canoes are also a bit different. Well, the Colorado Rockies are in the US baseball playoffs, so maybe the Revell -400 kit has a chance to be a "winner". I'll cheat and use a 747-200/300 Revell kit nose, as I'm terrible at making noses look better. I would like to attempt the -800 slice and dice. Seems to be the easier out. How well the -400 wings mate with the -800 fuselage could be another matter. Rather not be just kicking the can down the road. Best I could do. The flap fairings on the 748 were noticeably different so I cut the fairings from the 744 wing and glued onto the 748 wing filled with putty. The nose looks a little squashed in the photos and that is just lens distortion, the model looks like a 744 should look, glad I made the effort. The wings are one of the worst parts of the -400 kit. You'll get a better result by simply converting the -8 wing to a -400 wing. I agree, that's what I am doing. Click on the linK. Has anyone looked at the Dragon 747-4 ? I bought one a couple of years back at the UK IPMS Nationals very cheap, a cursory inspection leads me to think that it is a direct scale up of the 1/200 Hesagawa kit , but as for accuracy I dont know,but would this be a better starting point ? instead of all the correction work on the Revell kit. Any comment from anyone who has built this kit, would be useful. It has nothing in any way to do with the (now almost 40-year old!!!) Hasegawa 1/200 kit. It's pretty bad. I looked at the Dragon kit when first released, although it's not anywhere near as bad as the Nitto/Doyusa/Kepuyuan garbage, going up the list that would be Number 1 worst, followed by Airfix, then Dragon. I was stunned when Revell announce a thing like the An225, yet won't redo what could be a really big seller like the a B747-400, obviously making money is not a priority, yet I thought these kit manufacturers were supposed to be run by accountants these days. Steve, please keep us updated on your progress. 90% of their market thinks their 747-400 is totally fine, since it basically looks a bit like a 747-400. Or did you think a big toy manufacturer (because that's what it is!! Look at their website....) like Revell could live off of a crazy bunch of perfectionist modelers like we are? The model is just about complete, ran into two unexpected problem areas. Mating the 744 engines onto the modified 748 wing involves a lot of sanding and fitting. Second is getting a windshield decal to make a proper fit. The decal supplied by DRAW decals was designed to fit the mis-shapen 744 kit and is too wide. I ended up using the AA 3D decal but the fit was not perfect and had to use some heat to get the decal to lay flat. Still not completely satisfied to looked a little too high so I lowered it slightly and now it looks too little too low. Grrrr. To combat that I've been doing the following.... Place some bare metal foil on the wing surface where the engine will go. Take some gap-filling cyanoacrylate glue and squeeze a very small amount near the perimeter of the top of the engine pylon (where it will meet the wing). You wont need much of the CA, just enough to fill any gaps. After doing that hold the pylon to the wing for long enough for the CA to cure. If there are still gaps you can add some more CA to them. Once everything dries remove the pylons and sand away the excess CA on the sides of the pylon. If all has gone according to plan there will be no or very little gap remaining between the pylon and the wing. I have yet to find a better way to get rid of the gap between engine pylons (or the tail of a DC-10 as I'm currently building), or a wing joint. It allows all the filling and sanding to take place during construction to allow placement afterward. Hope this helps! Just about ready to wrap it up, I'll post the completed model in the "built models"
, but that will take a few weeks to show up. This is the Dragon model I built a few years ago. Ehhh. Steve, that's impressive work on the 747 conversion, and even in its constituent components it looks terrific. Regarding the Dragon 747, when I first saw it I thought it would make a nifty learning aid in a classroom or science exhibit, but if you're after a scale model that will trick the eye there are better starting points. The shapes on the Dragon model just looked too much off to my eye and the execution seemed too heavy for workbench purposes.